A.1. The court shall be a rectangle 20 feet wide (6.10 m) and 44 feet long (13.41 m) for both singles and doubles matches. B.1. Baselines. The baselines are the lines parallel to the net at each end of the court. B.2. Sidelines. The sidelines are the lines perpendicular to the net on each side of the court. B.3. Non-Volley Line. The non-volley line is the line on each side of the net between the sidelines and parallel to the net. These lines are located 7 feet (2.13 m) from the net. B.4. Non-Volley Zones. The non-volley zone is the area of the court bounded by the two sidelines, the non-volley line, and the net. The non-volley line and the sidelines are included in the non-volley zone. B.5. Center lines. The center line is the line on each side of the net bisecting the area between the non-volley line and the baseline. B.6. Service Courts. The service courts are the areas on either side of the center line, bounded by the non-volley line, the baseline, and the sideline. C.2. Net Size. The net length shall be at least 20 feet (6.1 m) extending from one sideline to the other. The net width shall be at least 2 feet (0.8 m). C.3. Mesh Size. The net’s mesh size must be sufficiently small to prevent a ball from passing through it. C.4. Height. The net shall be suspended over the center of the court and shall be 36 inches (0.914 m) high at the sidelines and 34 inches (0.86 m) high at the center of the court. C.5. Center Strap. A center strap may be placed at the center of the net to enable easy adjustment to the 34 in. (0.86 cm) requirement at center. C.7. Posts. Net posts should be placed outside the sidelines. Recommended placement is 12 inches (30.48 cm) from the sideline. Because outdoor courts are exposed to the environment, they require optimal orientation and fencing. – The position of the sun. – The effects of shadows cast onto the court surface. It is important to avoid players having to look into the sun when facing the opposite end of the court. As the sun moves from east to west during the day, then a similar orientation of the tennis court must be avoided. The effects of the sun are minimized by adopting a generally north-south orientation, such that the sun is to the side of (or directly overhead) the court. The general principle to follow is that, during times of maximum usage, low elevations of the sun should be avoided behind the server (it should be noted that the sun is at its lowest elevations early and late in the day). Due to the earth’s precession (tilting of the polar axis), a north-south orientation is not always the best solution. The times of day and the seasons of the year when the court is likely to be used should be considered. For example, an outdoor court may not be heavily used in the middle of the day when the temperature is high. Similarly, some courts are intended for year-round use, while others will only be used in certain seasons. Also, the latitude at which the court is being constructed should be considered, as locations closer to the equator, where play is more likely to take place all year round are more likely to be affected by the low-elevation of the sun in winter. As an example, the following table shows that, at the equator in mid-January, the sun is in the south-west during the late afternoon to early evening period, when it is also low in the sky. Thus, a court in this location in heavy use at this time of year should be oriented north-west to south-east by about 25º. – To contain the ball within the playing area. There are several different types of fencing. The wire type is commonly used because it allows maximum light to pass through and people to see in and out, it’s a relatively cost-effective option, and it contains the ball within the court boundaries (the effectiveness of this will depend in part on the height of the fence). Fencing should be constructed of (or covered with) rust resistant material, and should be free of protrusions that would increase the risk of injury to players. Plastic-coated chain-link netting is normally used. The mesh size needs to be sufficiently small to stop the ball going through. The ball is about 65 mm in diameter, so 45 mm or 50 mm mesh is often specified. The mesh should be fixed to the court side of the mounting posts to minimize erratic bounces. The height of the backstop depends on what is behind it. 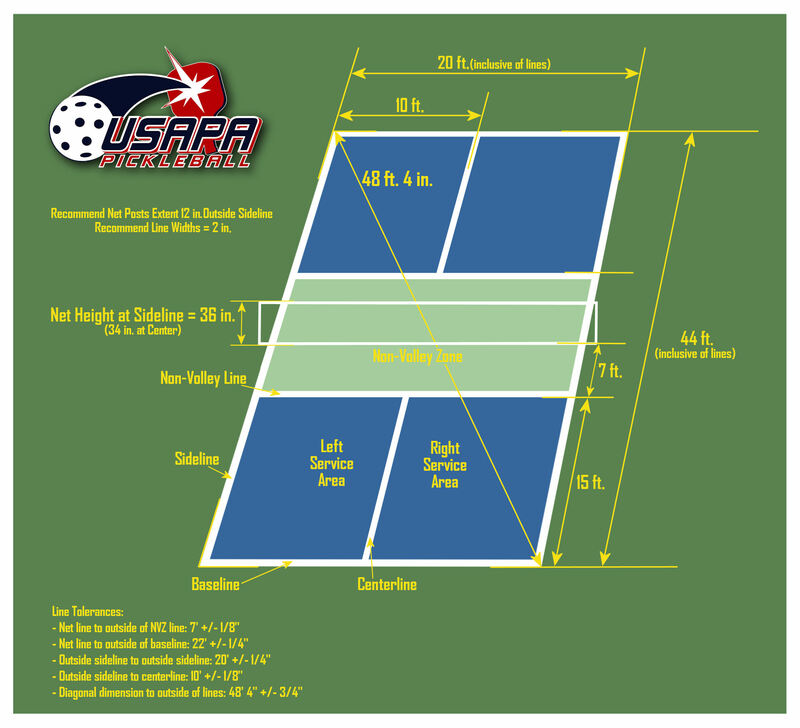 The minimum fence height is dependent on the location of the court and the problems and dangers associated with the ball going outside of the court confines. A minimum height would normally be 3.0 m, although certain conditions may require something higher, for example, if the court is close to a road or residential area. The sidestop should be the same height as the backstop for at least 6.0 m from the backstop, with 9.0 m being recommended. Where a sidestop is used, it should not be less than 0.9 m in height. Enough gates should be installed to allow entrance and exit at both ends of the court, to allow retrieval of balls. There should also be access for wheelchair players and any required maintenance equipment. While their primary role is to reduce and/or deflect the effects of wind, they provide a background against which the ball can be seen. Thus, they should be of a sufficiently contrasting color to the ball (see section on color). They also reduce glare and provide privacy. A single color piece of fabric is often used for this purpose. 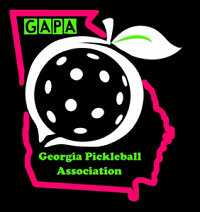 Be sure the contractor has experience installing and/or painting pickleball courts. Be sure to ask for and follow up on references for their past projects. Ask about the type of paint they will be using and determine how long it’s covered under warranty. At present, modular or tiled court surfaces are not recommended as ball bounce is inconsistent. Test before installation. Always review the line specifications and installation of all of the above items BEFORE the contractor begins.